I was inspired when I saw coconuts for 99c at the bodega, but when I got home it took me half an hour just to get all the delicious meat out of the nut. 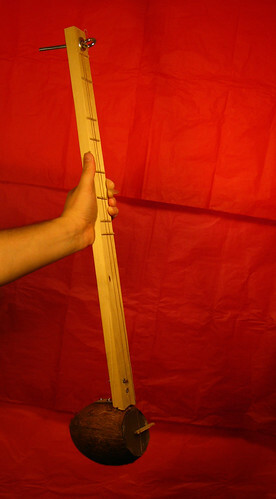 I keep making instruments that are too long for my short arms to play comfortably. You’d think I would’ve learned from the rotten stick guitar. 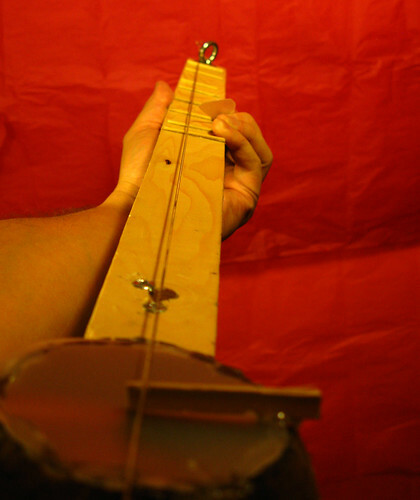 The frets are bamboo skewers – I tuned them by ear so the tuning is kind of shaky. I might add more frets later. Note how the bamboo bridge rests on a point on the membrane (architectural vellum)- this helps to transfer the vibrations of the string. The pick is made of two layers of vellum glued together. 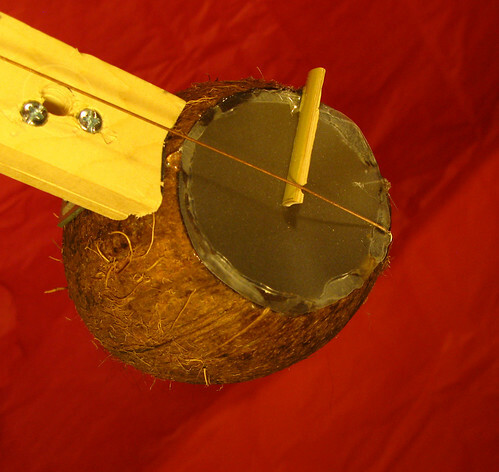 The coconut banjo sounds like this. This entry was posted in instrument-a-day 2008 by ranjit. Bookmark the permalink.